UK supermarket chain J Sainsbury has expanded its presence in the rapidly-growing convenience store sector by buying the Jacksons group of stores. Sainsbury's said all Jacksons' workers would stay with the business and the stores would operate as a separate business run by the current management. The acquisition raises Sainsbury's portfolio of convenience stores to above the 250 mark. In early afternoon trade Sainsbury's share price was virtually unchanged. The move is the second chain of convenience stores that Sainsbury's has bought, following its takeover of Bells Stores. Sainsbury's has 54 Bells Stores, and also operates 67 Sainsbury's Local stores and runs 22 outlets in partnership with Shell. The convenience store sector is seen as one of the fastest growing areas of food retailing. "When we announced the sale of Shaw's, our US supermarket business in March 2004, we indicated that we would use a proportion of the funds to expand further into the convenience sector and this acquisition provides us with a great opportunity to do that," said Sainsbury's chief executive Justin King. Sainsbury's did not say how much it was paying for Jacksons, but said for the year to 24 April, the group's turnover was £143m ($253m) and it had net assets of £25.5m. 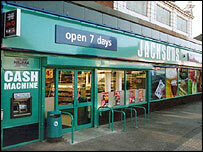 Jacksons' managing director Angus Oughtred said the deal was "in the best long term interests of Jacksons customers". "It will enable us to continue to grow the business enhancing our offer to local customers as well as retaining our employees under their current employment terms," he said.